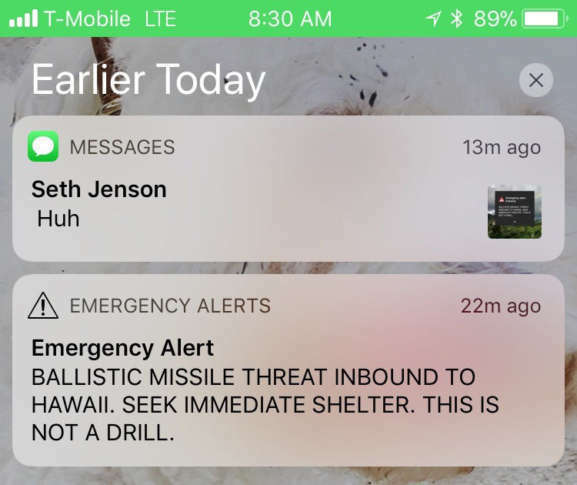 It was a terrifying couple of minutes in the U.S. as an emergency alert was sent out in Hawaii urging citizens to seek shelter from an inbound ballistic missile. It turned out to be a false alarm but WTOP's John Aaron, who is honeymooning on the island, described the scene of panic and fear — and its likely long-lasting effects. WASHINGTON — An emergency alert in Hawaii that urged citizens to seek shelter from an inbound ballistic missile was a false alarm, according to Representative Tulsi Gabbard. The alert however caused a lot of alarm and fear on social media and in the state. WTOP’s John Aaron was in Hawaii on his honeymoon when the alert went out. Aaron and his new wife grabbed their phones and clothes and tried to find shelter in a supply closet in their hotel. “A very chaotic and nerve-racking scene, some people were crying, a lot of people were frantic. I was just trying to find somewhere safe,” Aaron said. The alarm began when CNN associate producer Amanda Golden tweeted out a screenshot of the alert. Politico reporter Tim Alberta tweeted that sirens were going off on the island and military personnel were bunkering down. Hawaii’s Emergency Management Agency tweeted that there is no missile threat to Hawaii, prompting questions as to why the alert went out. Although news of the alarm being false spread quickly, the terrifying effects are likely to last a long time. “Obviously all of the tension we’ve heard, the bluster between North Korea and the U.S., it really hit home that this would be the effect of that. The possibility of a missile being inbound to Hawaii presumably from North Korea, although no one said that, that possibility does not seem that ridiculous at the moment,” Aaron said. Jittery morning in Maui even after all-clear given. Incoming ballistic missile – over the hotel PA – are the most terrifying words I have ever heard.